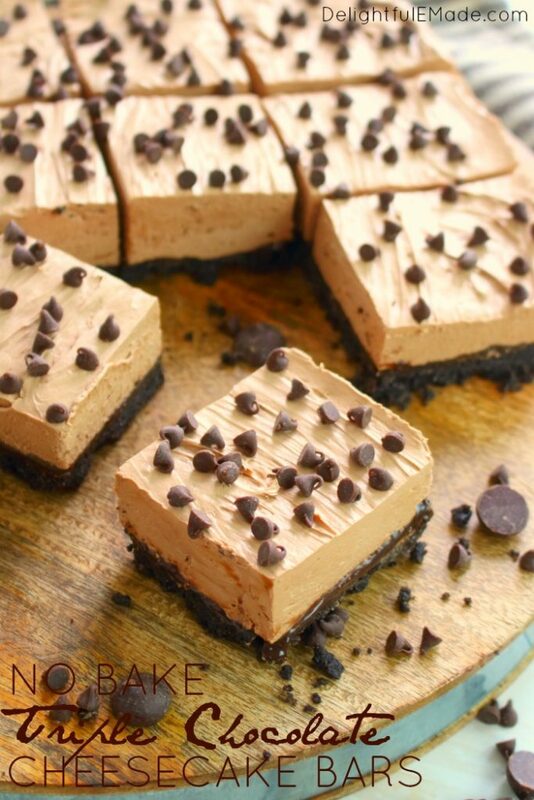 Chocolate Cheesecake Bars for every Chocolate Lover! 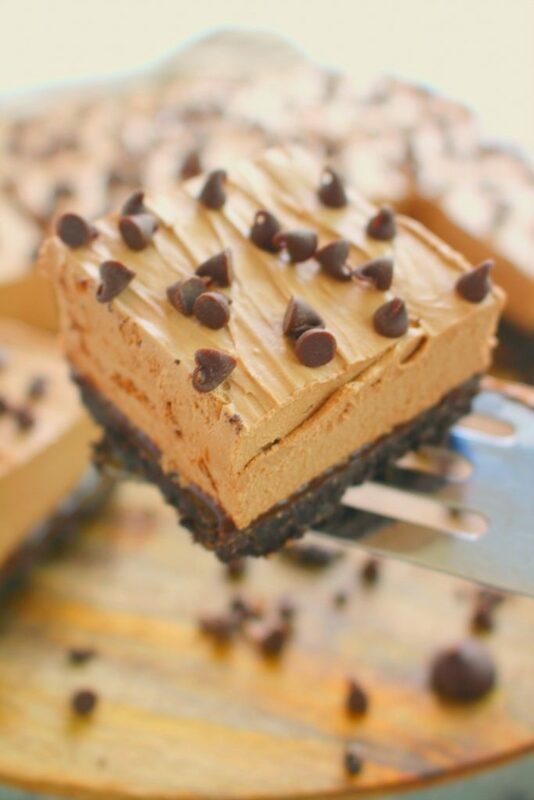 If you’re looking for an easy, no bake cheesecake recipe, then these chocolate cheesecake bars need to be in your life! 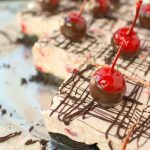 Made with layers of OREO’s, hot fudge, and chocolate cheesecake, these cheesecake bars are every chocolate lovers dream! Once the warm days of summer hit us head-on, I don’t like turning on my oven. It heats up the house, and increases an already high air conditioning bill. 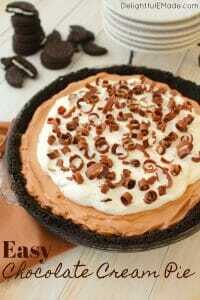 However, that doesn’t mean I’m waiting until fall to make an amazing chocolate dessert. 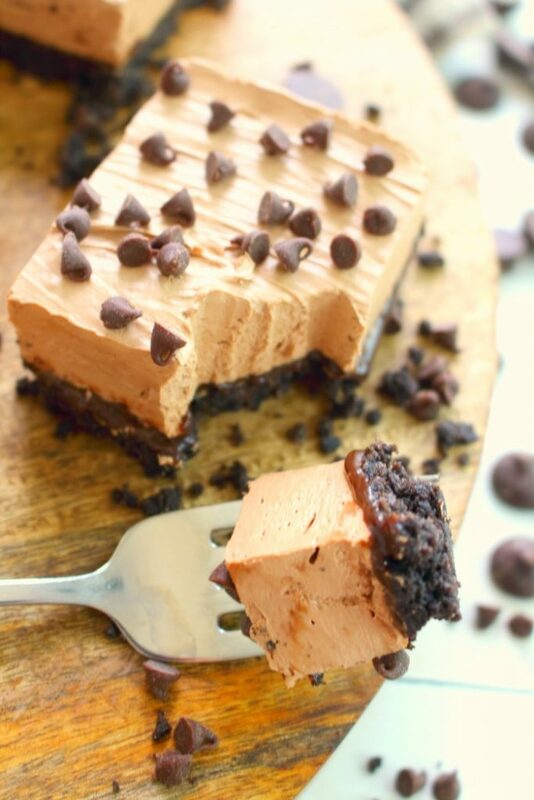 In fact, the dog days of summer are the perfect time for these incredible No Bake Triple Chocolate Cheesecake Bars. 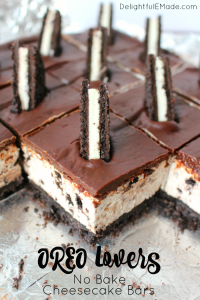 Made with an awesome OREO cookie crust, a layer of hot fudge, and thick chocolate cheesecake, these bars are the ultimate cool, creamy treat for a warm summer day. For this super-simple crust, you’ll just need two ingredients: OREO’s and butter. To crush the OREO’s, I put them in my food processor, and crush for about 20 seconds. I then add the melted butter and pulse a few more times to combine. Then, turn out the cookie crumb mixture into a foil lined pan. Press the crumbs firmly into the bottom of a foil-lined pan. If you don’t have a food processor, placing the cookies in a resealable plastic bag, and crushing them with a rolling pin also works well. Make sure to crush all big chunks of cookies into crumbs. Over the top of the pressed crust, add a layer of hot fudge ice cream topping. To make the topping easily spreadable, I heat it in the microwave for about 30 seconds and pour over the crust. 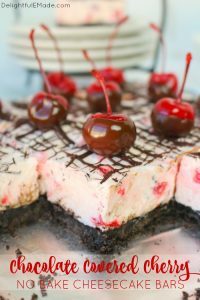 Spread evenly onto the entire surface of the crust to ensure every bite has a bit of hot fudge goodness! 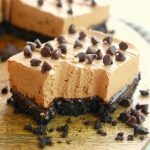 Very similar to my Chocolate Peanut Butter Mousse Bars, this cheesecake filling is thick, creamy and has a wonderful, silky texture and consistency. 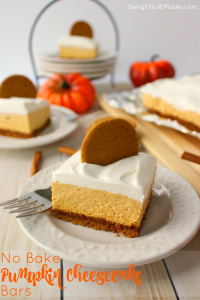 Best of all, you just need a few ingredients to make this filling. 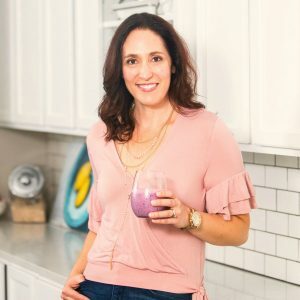 You’ll start with room temperature cream cheese – the temp of the cream cheese is important, as cold cream cheese right out of the fridge will typically render chunks or pieces of cream cheese in the filling. To the cream cheese, you’ll add powdered sugar, and the melted chocolate. When mixing these together, work slowly. Stop the mixer often to scrape down the sides of the bowl. Then, you’ll mix in the whipped topping. In just a few minutes, you’ll have a thick, silky chocolate cheesecake filling that makes this recipe incredible! 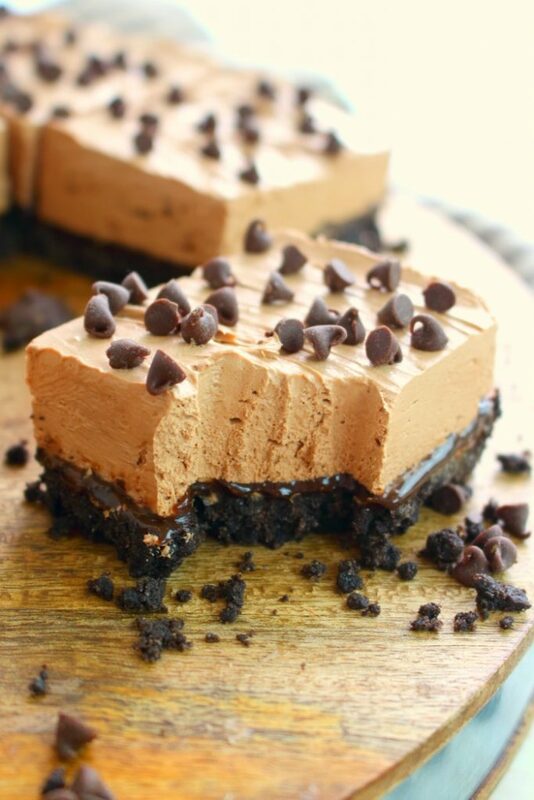 Before diving in to these amazing chocolate cheesecake bars, the filling will need a chance to set up. Refrigerate for at least 2 hours before cutting into the squares. 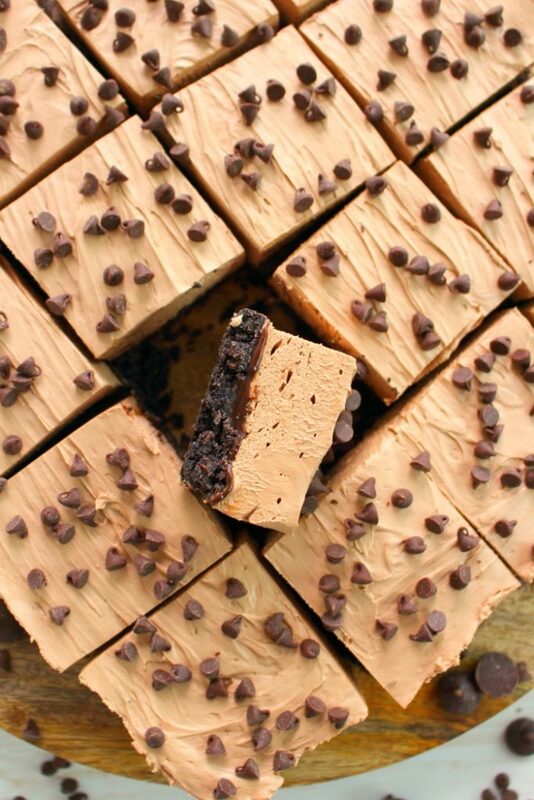 Once the squares are cut, top with the mini chocolate chips for a fantastic chocolate garnish! These bars are awesome for just about any occasion. 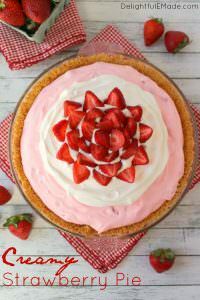 This cool, creamy treat is especially delicious to enjoy on a hot, summer day! Line a 9x9" square pan with aluminum foil. With a hand or stand mixer, cream together the cream cheese and powdered sugar and mix until creamy and slightly fluffy. 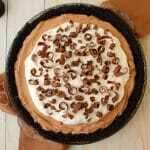 With the mixer running on the lowest speed, gradually add the melted chocolate to the cream cheese mixture. Stop often to scrape down the sides of the bowl. Once all the chocolate has been mixed in, mixture will be rather thick. With the mixer running on lowest speed, gradually add in the thawed whipped topping. Mix until smooth and completely combined with the cream cheese mixture. Spread evenly over the top of the crust, making sure to spread firmly and evenly into corners of the pan. Refrigerate for at least 1-2 hours, or until firmly set. 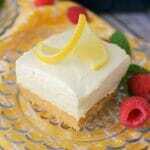 Just before serving, lift the cheesecake from the pan using the sides of the aluminum foil. Cut into 16 even squares and then top with the mini chocolate chips. 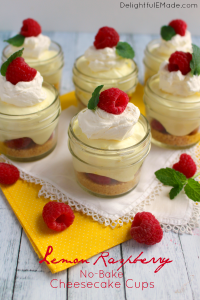 Refrigerate any leftovers in an airtight container. 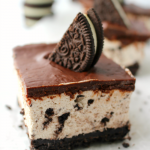 To create a more firm crust, and evenly cut squares, bake the OREO crust for about 5 minutes at 350 degrees. 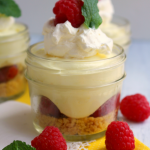 This is completely optional, and no longer makes this recipe "no-bake". However, baking the crust (again, completely optional) for this short time, helps firm up the crust yielding uniform squares. Those sound wonderful! 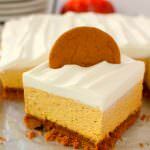 I make a very similar cheesecake/ pie but I like the idea of turning them into bars! Pinned.